Several weeks ago, I was placed on assignment for work to go to Guanajuato, Mexico. During this last trip and after all my work duties were completed, I wondered off to the Vineyards in the beautiful and picturesque, San Miguel De Allende! 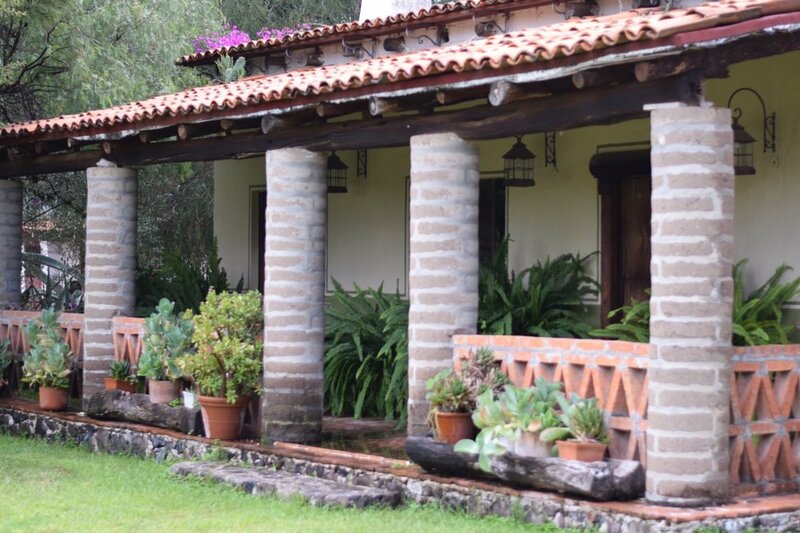 Just 15 minutes from the city on the Queretaro highway, is Bodega Dos Buhos, a beautiful ranch hacienda winery. I immediately knew that I wanted to book a winery tour at Bodega Dos Buhos, offering a rustic ranch vibe with flavorful organic wines. The Guanajuato wine trail is a new wine route in Mexico that I have wanted to visit for quite some time. It is said that the soil is some of the most "Organic", even though Mexico is not considered a region to be producing organic wines. Although farmers have been planting agriculture for many years, the use of chemical treatments and pesticides has never been the norm in San Miguel. The soil actually has far less warring against it than there is in other places that have been producing wine for decades. Since the land has not sustained damage by the pesticides, this type of soil is producing wine that is more complex, full and truly more organic than other sustainable areas. The name Dos Buhos, "two owls", came from the merging of two cultures with the same dream and vision. They have adapted a "traditional" style of winemaking, using the least invasive technology in order to care for the fragile art of what we call Wine making. We took the Spanish tour and were guided by Gedubides (Don’t worry, there are English tours available). Gedubides took us around all the vineyards and had us taste every single varietal grape that was available. The awesome part is that we visited the winery during the only time of the year that you are able to eat the grapes. In the middle of our tour, we were caught in the middle of a thunderstorm, which was not on my itinerary. Even though we were not prepared, I have to say that it was super fun! We also got to go into their cellar and production room. The owner and winemaker grew up around art and music her entire life, which has had a major influence in her winemaking. During the aging and fermentation process, she plays opera music through a speaker, as part of her winemaking. It is said that the sound waves help influence the maturing process and could “possibly” produce a better-tasting wine. Although, it is not scientifically proven, it is believed that sound waves, including ultrasounds, have an impact on molecules, so it could accelerate the chemical process. Regardless, I think its pretty cool! After our tour, we headed back to the tasting room, which was decorated with an eclectic array of furniture and old artifacts from some of the first trains in Mexico. The tasting room was huge and filled with art from local artist in San Miguel De Allende. During our tasting, we tried the Rose, the Sauvignon blanc and the Tempranillo, accompanied by a delicious cheese plate. All three wines were delicious and left me wanting more. I was defiantly able to taste the difference in the wines from typical California wines. The wines felt more earthy, complex with intense flavors. To say this wine tour was amazing is to say the least. I'm so happy to be returning to Dos Buhos really soon and visiting with the owner to learn more about the orange wine making process and other new varietals they are working on. Thank you Michelle and Gedubides! This article was published on San Miguel De Allende Wines. Click here to read my published article! You can check out this article here that was published on San Miguel de Allende Wines.